The "Aligned" Output (in Track 3 -"Audio 3") on its own - press the A Key. The "Aligned" Output with the Guide (in Track 1) - press the E key. If background processing is turned on, the output audio will already have been rendered and pressing the Space Bar will start playback of audio, and you can skip the next paragraph. If a red line still shows above the output track), the APT process needs to be rendered before it can be played. Consult the rendering and background processing preferences for details of the other options for rendering processed audio. Then just press the Space Bar on the keyboard. 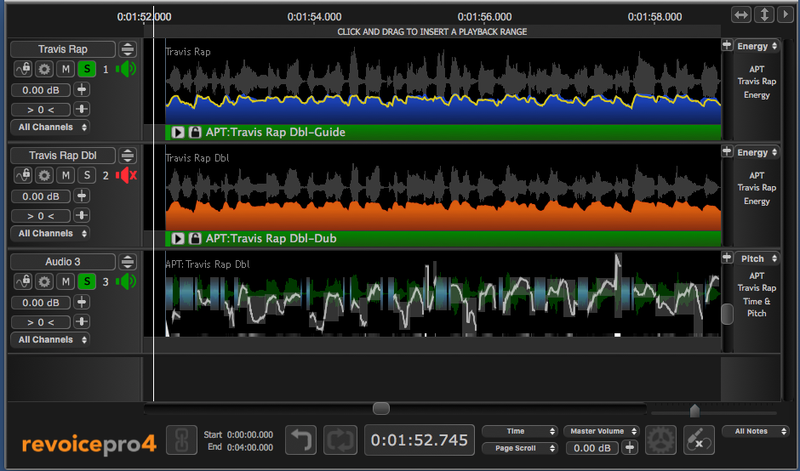 This will start playback through the soloed tracks. In the track named Audio 3, the dark green shows the output audio waveform, and the various lighter blocks and lines show the time-adjusted output measurements from the pitch measurement system.